Nature is dangerous. Bite your face, crush you with falling rocks, lull you into a peaceful hypothermic demise kind of dangerous. In fact, many things in nature are so dangerous that entire religions were once formed around appeasing nature’s angry gods. We as a species used to have a healthy respect for nature and the general understanding that practically anything in it could kill us at any time. It was understood: Nature is a BAMF. So why — please someone explain to me why — a person would brush past multiple warning signs and dip even a toe into a boiling acidic pool? By now you’ve probably heard this story: in June, a young man from Oregon ventured off the trail for a therapeutic soak in one of Yellowstone’s geysers and literally boiled himself to death. Boiled. To. Death. It defies explanation and yet he wasn’t the first. He won’t be the last. The guys who trampled the Grand Prismatic Spring were lucky they didn’t meet the same fate. The Washington Post reports over one-hundred deaths have occurred in America’s National Parks every year for nine of the past ten years. These deaths range from more common drownings and falls to exceedingly rare animal attacks. One-hundred-ish deaths per millions of visitors each year may seem like a reasonable statistic until you consider that in almost all cases these deaths were totally preventable. In the era of precipice selfies and daredevil challenges, people have become dangerously brazen and cavalier in the pursuit of their next attention-seeking post. The lines of appropriate and respectful behavior in our National Parks have been blurred and we’re seeing more and more outrageous occurrences. Stacked rocks like this one at Toadstool Geologic Park are pretty stable if left alone. Just a couple months ago we railed against the disrespectful and dangerous vandalism of Duckbill Rock in Oregon when a group of tourists pushed a famous stacked rock off its pedestal. They later claimed the rock was a safety hazard to tourists and they were trying to prevent visitors from getting hurt. Ok, that might sound misguided but distantly reasonable until you consider that the vandals ignored signs and ventured into a roped-off area to reach Duckbill Rock and the only way a tourist could get hurt by would be by breaking the rules themselves. Even an adorable prairie dog is a potential threat as a possible carrier of the bubonic plague. Every one of America’s National Parks reminds visitors on maps, with signs, and at visitor centers to keep a safe distance from wildlife, and yet, those rules also continue to be broken. About a year ago, on a visit to Rocky Mountain National Park, I saw a crowd forming on a tundra hillside to view a herd of bighorn sheep. Cars were haphazardly parked and abandoned all over the roadway (which at that point is a tight, winding, two-lane road with no shoulder) while their former occupants edged closer and closer to the animals. Annoyed by the traffic jam, but interested in the animals, I drove to the next turnout, appropriately parked my car, and took off on foot towards the herd. Because I drove beyond the bulk of the tourists, I was in the perfect location to photograph. The herd was actively walking away from the swarm of tourists and toward my waiting camera. I strategically positioned myself with a rocky outcrop between us where I could comfortably and successfully shoot at 200-300mm. The light was beautiful, the vista backdrop incredible, and the animals fascinating. I happily shot for ten minutes, commending myself for my brilliant position in front while everyone else got photographs of bighorn sheep butts. 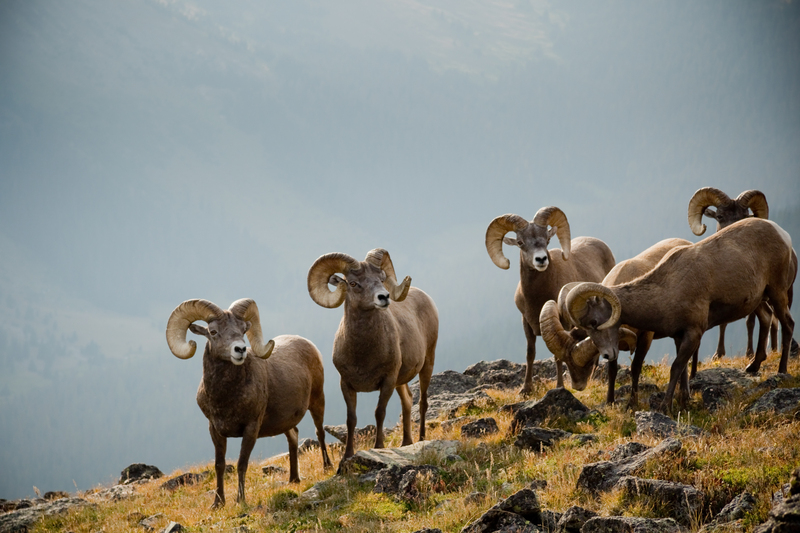 The perfect perspective for photographing six beautiful bighorn sheep. One sheep stands apart from the herd in Rocky Mountain National Park. Then things got a little uncomfortable. While I had been distractedly photographing a couple of individual sheep, the animals had been herded closer and closer to me by the crowd of tourists behind them. At this point, I was about one-hundred feet away from what I thought was the closest sheep. Nope. Having been fully engrossed in my camera, I hadn’t noticed the enormous ram who decided to investigate me — the source of all the strange clicking sounds. I heard a noise from above and looked up to see a terrifyingly large beast looming about eight feet above me. We locked eyes while the larger herd of sheep kept moving closer, a herd of tourists close behind. At once, I realized my massive error in judgment. Yes, I had lined myself up for the perfect photographic perspective, but I had also placed myself in the direct path of any animals hoping to avoid dozens of ogling tourists. I played through all of the catastrophic scenarios in my mind: death by headbutt, death by trample, death by headbutt then trample. I quickly invented dubious plans to save myself by squeezing between the boulders at my feet, or by using my tripod as a bludgeon, all the while waiting for the ram to charge. Not what you want to see looming eight feet above you. The ram seemed less concerned with a little more personal space. The bighorns continue on their way with a crowd of tourists not long behind. Happy Birthday Zion National Park!